As an evolving industry, there are a lot of “ifs” that may transpire in the world of SEO every time and then. Today, the field of SEO has gone through a lot of ups and downs which greatly changed the way websites achieve higher ranking in SERPs nowadays. Nonetheless, it can be said that it is indeed one of the most utilized tactics used in the world of digital marketing nowadays. With over 100 billion searches made on Google per month, having a well-optimized website that ranks high on SERP can certainly help a business expand its audience reach and boost its brand awareness. Google has decreased the number of organic blue links displayed as the result of a search from 10 to 8.5. Having a strong keyword in the brand name can help a business rank 5 spots higher than businesses which have no keyword in their name. 72% of people who conducted a local search visited a store within five miles. 62% of B2B marketers and 51% of B2C marketers have optimized their blogs for mobile for SEO purposes. Revamping and republishing of old blog posts with new content and images can increase organic traffic by as much as 111%. Almost 40% of people today conduct search through their smartphone in an average today. With these statistics, we can say that the field of SEO continues to change at a much higher pace than it was 5 or 10 years ago. However, to make your website gain a higher ranking of SERPs is not “another walk in the park” kind of task. Due to its complexities and technicalities, one needs to be dedicated and patient enough to practice and master the multitude techniques of SEO. And as an evolving platform, one must also keep up with the latest trends and shifts in the field in order to ensure that all their efforts are still in line with the industry standards. That said, knowing the latest SEO trends has become an imperative each year. And with 2017 fresh on our mind, it is now the perfect time to improve your SEO strategy for this year and beyond. Here are the latest trends that are set to change the SEO landscape this 2017 onwards. Schema Markup will be further utilized to improve and simplify the purpose and content of the website and make it more appealing to users. Search Engines, especially Google, will continue experimenting with SERPs layout, particularly its layout and width of snippets. More SEO will utilize Google’s Accelerated Mobile Pages (AMP) to improve their site’s loading speed on mobile devices. Content density and “per word value” metric will become a standard among content marketers. More SEO will leverage Personal Branding to secure more links and space from authoritative websites and build more trust with their audience. Voice search will gain more popularity as more and more access internet on their mobile device. Machine learning and Artificial Intelligence will receive more updates, and possibly be used in other areas such as data interpretation and marketing automation. These changes in SEO landscape will help you improve your strategy and ultimately, achieve a higher position in SERPs. 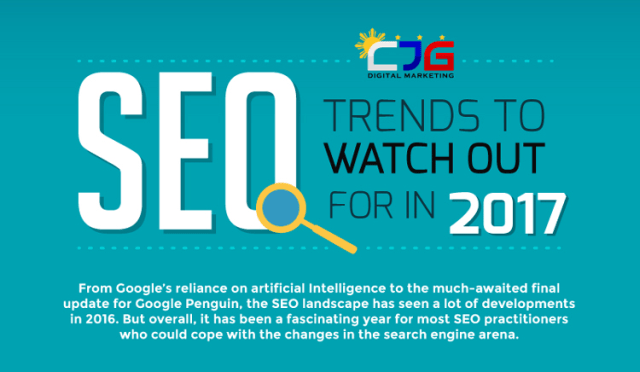 Check out the infographic below made by CJG Digital Marketing which presents the most important top 8 SEO trends to watch out for in 2017 that can help you with your digital marketing strategy for this year.